Filmed completely in 1080p high-def video, the aerial doc starring Sydney Pollack, Tony Bill and Lorenzo Lamas will make its HD DVD debut with a 1080p/MPEG-2 transfer, Dolby Digital-Plus soundtrack and a trio of exclusive HD extras, including an extended sequence, 12-minute movie montage and new original music from Enya. Currently, the release is only available for pre-order through the online retailer mypilotstore.com. Estimated ship date is November 1, with a $24.95 list price. Though Terwilliger has not announced any other HD DVD (or Blu-ray) disc releases (in fact, 'One Six Right' seems to be their only release, period) the next-gen formats can only benefit from more diverse programming, so hopefully this is sign of more high-def releases to come from independent distributors. 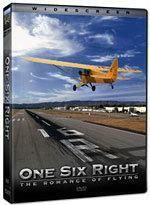 We've added a listing for 'One Six Right' with full disc specs to our HD DVD Release Schedule.